That cat is lucky, she rarely ponders her place in the universe and apart from a few moments when she's being bullied by the boys her life is full of joy and wonder. 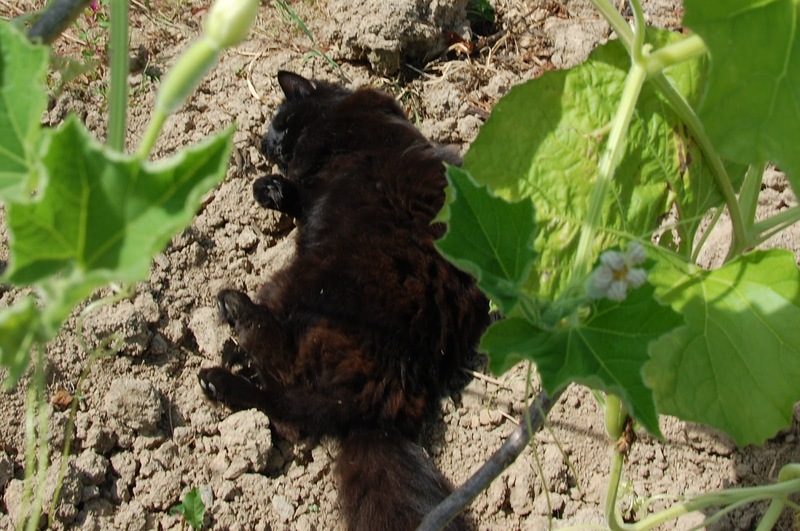 She bounces around like a piece of fluff and takes pleasure in just about everything including rolling in the dust. This week for me, not so much joy. The Whangaparaoa pumpkin plot came tumbling down when I found a huge rogue yellow fruit forming. I should have know something was up because the plant was so vigorous from the outset but hey, I'm growing for landrace selection so some variation seemed welcome. However, it seems that somehow my separation techniques last year were inadequate and that Pink Banana squash that wasn't somehow spread its evil influence all the way across to my Whanga patch. The other plants growing from the same saved seed batch look o.k. but who knows what horrors lurk within their genes. So that concludes this round of experiments, I don't know, five years? and now it's lost. I'm sorry I don't have the energy to keep trying. Even getting more clean seed is a project, my originals came from New Zealand but I no longer have contacts there to send me more. I'm sorry I've been so down that I let the raspberries decay on the canes, all the tomatoes that are turning red have blossom end rot, the potatoes are blighted and that something has chewed through the last couple of plants of Painted Lady runners which I was growing out for seed just as pods were beginning to form. Even the courgettes make me feel bad by being prolific when I was determined not to let them bully me. And I'm sorry this post is such a downer. It seems necessary somehow that the blog presents things in a positive or amusing way. Sometimes that requirement can silence me for days. Disappointment is really tough to deal with, isn't it? I'm so sorry. I've left fruit to rot too, in my time - which could be a metaphor, as well as being literally the case. I have a friend in New Zealand - assuming the Whangaparaoa is readily available there, I could ask him to send some over, if you do want to have another go. No need to decide yet, though. I get discouraged as well, what with flooding waterlogging and health problems always conspiring to mess things up. Just keeep on going, you'll get there! Personally, I don't see why you have to be upbeat all the time; we all have down times. I have contacts in New Zealand from CIX, if that might help. Hugs - hope the black dog buggers off soon. Thanks Z, for the sympathy and the offer. Not sure if I want to try again. Maybe I'll just stick to local varieties. Thanks Robert, you take care too. Mac, thanks. I'd forgotten the Cix connection but as I said, not sure if it's the right way to go. Have to think about it - my haphazard gardening isn't really the way to make horticultural breakthroughs. I can see you being chased by courgettes a lll the way into a dark corner of your house. I know well the experience and I only had one plant! I also understand the depression that can be induced by things taking a, what wee deem to be, wrong turn. There is reason in all things . God tends to sow things that I love in odd places for me and if I try to shift them to where I think I want them, they die and any other plants in the garden of the same species. I have learned to be grateful for wherever they grow and not force my sense of order on anything any more. That waterlily is beautiful, seldom have I seen one such a deep red.